I don’t imagine that too many academic presses ask their authors to craft the book cover. Maybe the index. And maybe some acknowledgments. But not the cover. Yet that’s what JHUP asked of me. 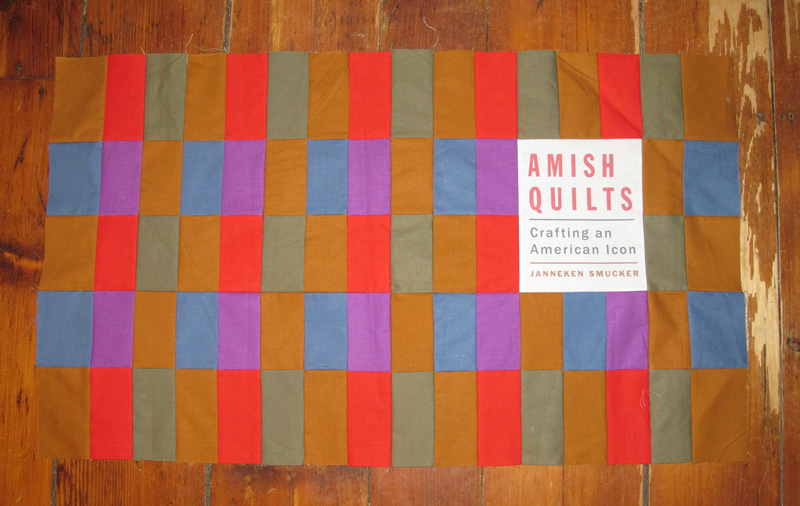 Then again, Amish Quilts is hopefully not like most books published by university presses. It’s the warm and fuzzy version of a scholarly book. And by warm and fuzzy, I mean covered in a quilt. I collaborated with JHUP’s designer to imagine a custom book cover, pieced from the lush fabrics of Michael Miller’s Cotton Couture line. And while not too many Amish ladies likely are ordering these perfectly hued cuts off the internet, I expect they are exactly what every circa 1940 plain-clothed quiltmaker dreamed of. Martha, my collaborator, designed the title block with a clean, modern typeface. I then sent the jpg off to the good folks at Spoonflower (where you can, in fact, not only print custom fabric, but also print custom wallpaper!) and received the custom fabric back in about 10 days. I then machine pieced the cover quilt at 1.5 times the size of the cover, since I’ve never been into making postage stamp quilts. When the image is reduced in size for the cover art, it should make my quilting stitches rival those Lancaster County queens of 14 QSPI!